It’s beginning to feel a lot like the holidays around here…so let’s kick things off with a *charming* GIVEAWAY and some festive table decorating ideas, shall we?! The inspiration for this playful holiday tablescape was the Rise N’ Shine collection from Vintage Charm™ Inspired by Pyrex®. If you’re not yet familiar with Vintage Charm, it’s an adorable line of glass mixing bowls that feature a modern twist on popular Pyrex® designs from the 50’s and 60’s. The Vintage Charm bowls are great for place settings, baking and gifting. Whether you’re giving to a hostess or baker, they will love these darling bowls! They’re available online and in-store at Target, Macy’s, Walmart, Amazon, and ShopWorldKitchen.com. Use the coupon code: VINTAGE20 to receive 20% off your Vintage Charm set on ShopWorldKitchen.com. And for a chance to WIN a set of nostalgic Vintage Charm prep and serve bowls, just post a comment here mentioning which Vintage Charm design inspires YOU the most. Full details on the giveaway are at the bottom of this post. Speaking of picking favorites, I was able to select any Vintage Charm pattern to work with for this holiday project, and was super excited to choose Rise N’ Shine! My family recently moved to Northern California (just a few months ago), where my dad has worked in the agriculture and farming business for his entire life. My husband is working with him now too, so farming is a huge part of all of our lives, and there are so many things I’ve come to appreciate about the industry. So, between the farm-inspired graphics and the retro-modern style of Rise N’ Shine, I was instantly smitten with this pattern! Now, I know that when you hear “farm inspired”, a contemporary look probably isn’t usually the first thing that comes to mind, but unexpected themes are my favorite! I had a great time dreaming up fun ways to merge farm + modern + holiday, and these dishes were the perfect starting point. 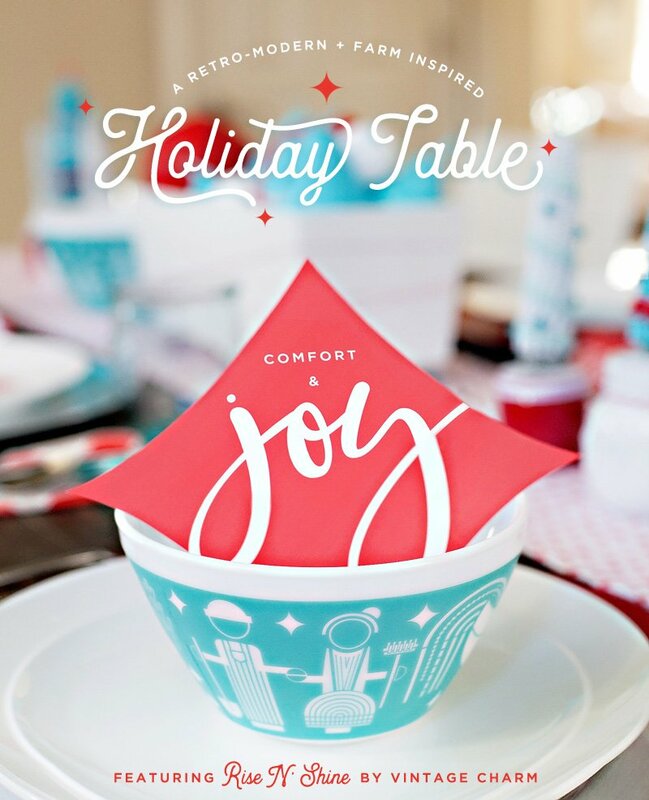 The little “shine” graphics on the bowls that kind of look like twinkles became my key focal point for the paper designs, which can be downloaded for free right here: Place Setting Accents | Party Circles | Place Cards. To make the little trees, I removed some of the kernels at the bottom of the corn cob to create the “trunk”, then spray painted the tops and used silver craft paint, applied with a brush, on the bottom. A bamboo skewer is inserted into the bottom of the corn to make it stand up. The jars and tins holding the trees are filled with dry floral foam, and the extra part of the bamboo skewer is inserted into the foam. I also cut some “shine” shapes from card stock to create a little “holiday magic” above the table! The cut outs are hot glued to fishing wire for more of a floating effect. Here is the tracing template I used. 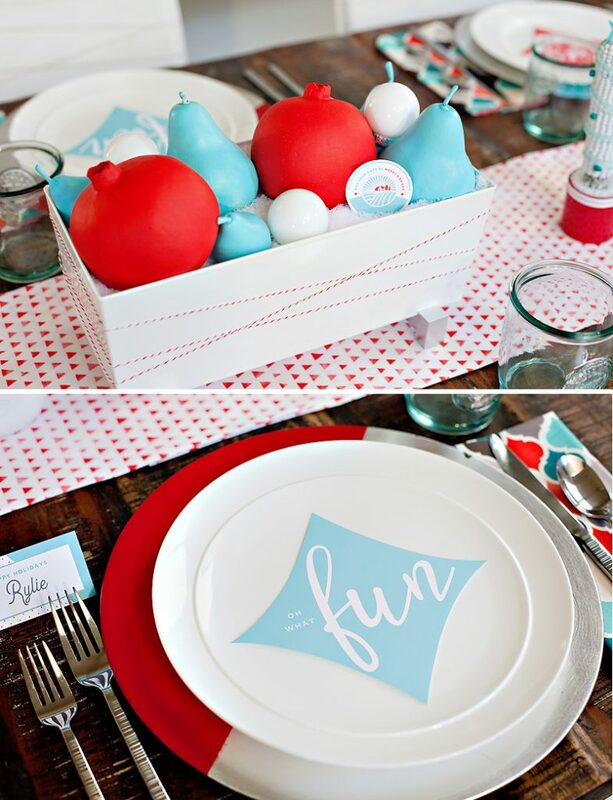 Pattern played a key role on the table too. I went to the fabric store and found two prints with a nice retro-mod vibe in my color palette, then cut a table runner and napkins from the fabric. 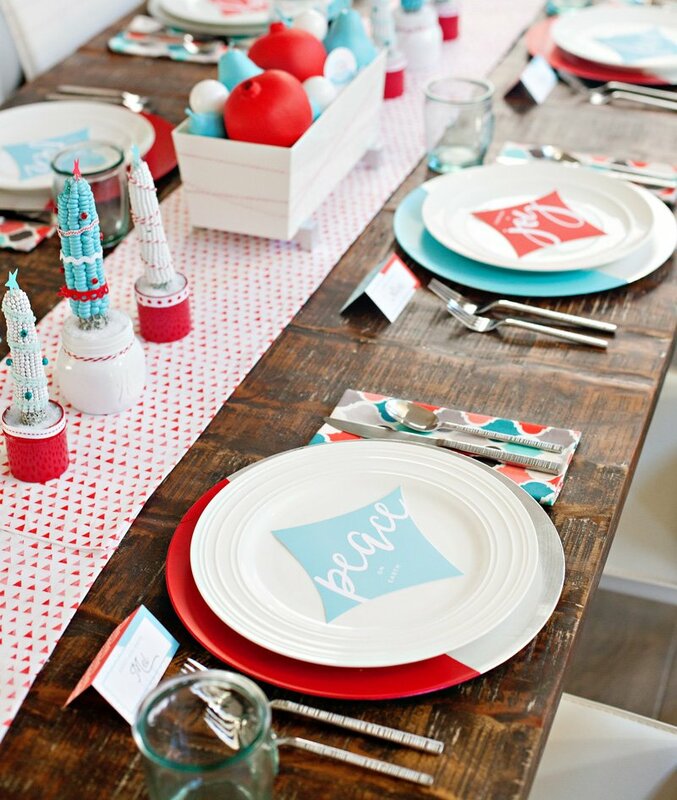 This is one of my favorite, inexpensive ways to customize any table design! These place cards are included in the free printables too – but heads up that the templates are blank (aside from the HAPPY HOLIDAYS text) and most easily used with handwriting. 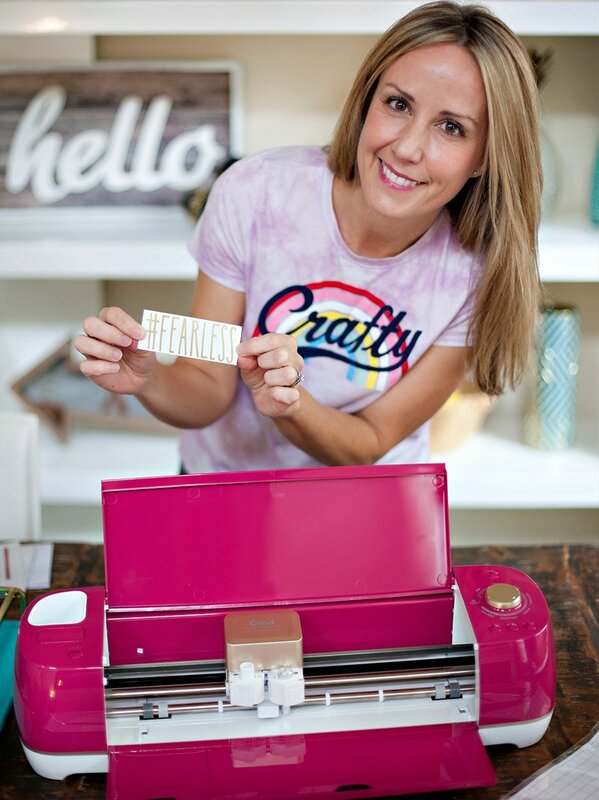 If you’d like to customize them yourself digitally – the font I used for the names here is called Heritage. 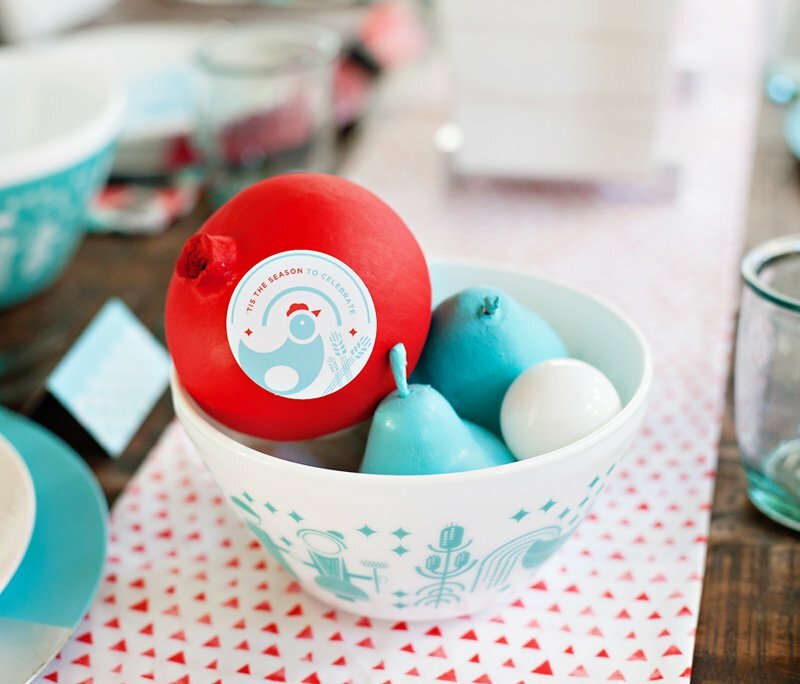 The table centerpiece is a mix of painted pomegranates and pears + mini ball ornaments. I also tucked party circles into a couple spots for added detail, but kept the overall look more minimalist as a nice balance to the embellished trees on either side. Chair backs are often overlooked when it comes to decorating a table, but they seriously make such a big impact on the design! I just did a simple baker’s twine wrap on the chairs here, paired with a couple more of the paper “shine” cut outs. 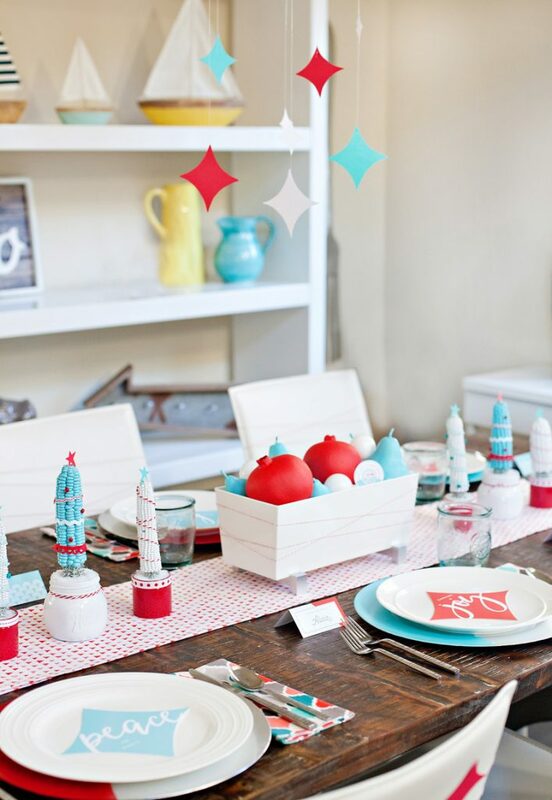 Hope you’re feeling inspired to create a little retro-modern holiday magic of your own! ;) If you have any questions about this table that I didn’t cover, please feel free to ask away in the comments. 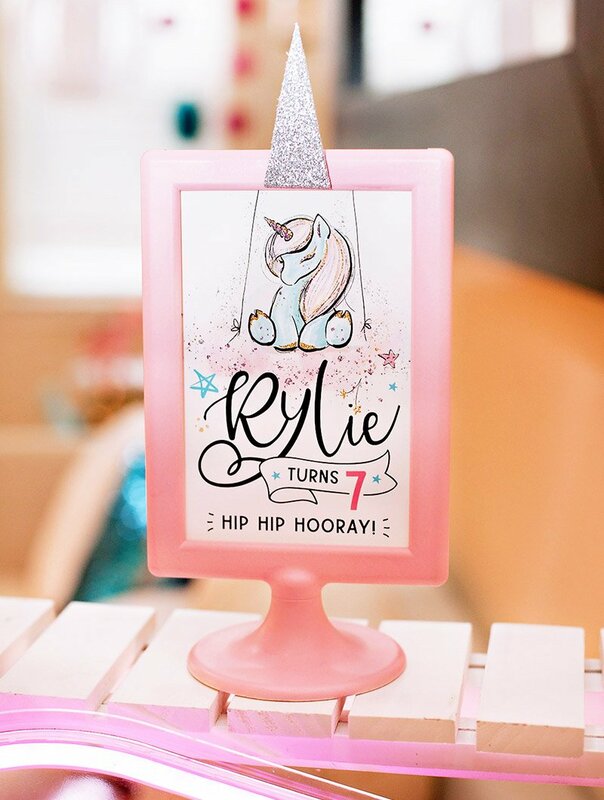 And now… who’s ready to win some adorable dishes?! To enter, just leave a comment mentioning which of the Vintage Charm™ Inspired by Pyrex® designs you like the most or feel the most inspired by. 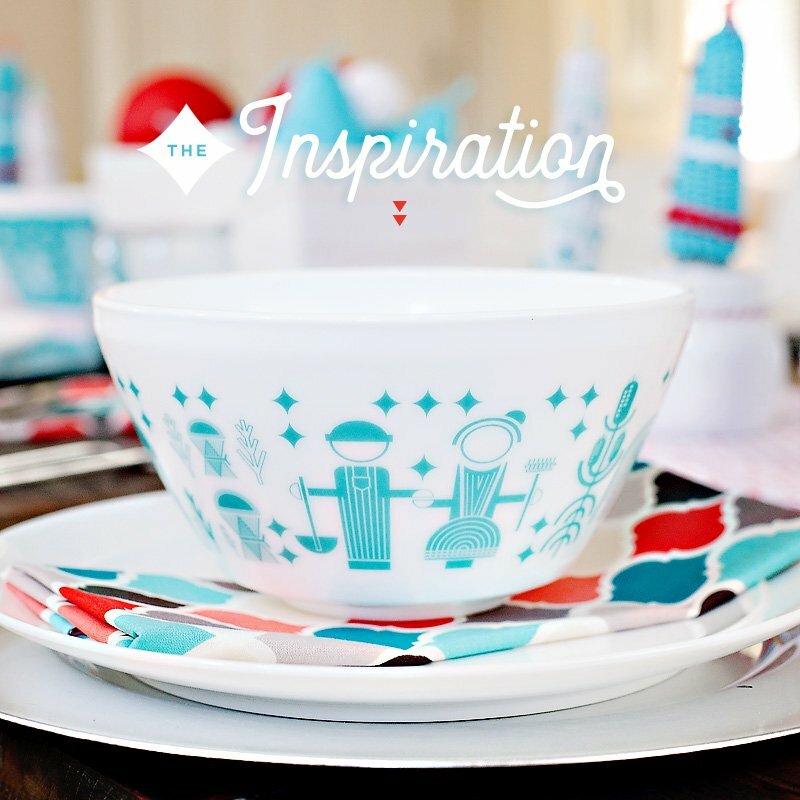 One commenter (chosen via random selection) will win a Vintage Charm Mixing Bowl Set in the design of their choice. Enter by Tuesday, November 22, 2016 at midnight PT. The winner will be notified via email & announced here. Disclosure: This post is sponsored by Vintage Charm™. As always, all opinions & ideas are my own. Thank you so much for supporting the companies that make it possible for me to keep the creative content coming your way! I love the Spot On dots. They’re simple, classic, and they’ll work all year in my kitchen! Thanks for sharing! Beautiful design! I love the trees! What great designs. I like the Rise and Shine in particular. I love the Birds of a Feather series. I like the Corell Rise ‘N’ Shine bowls. They look weirdly familiar. I think my grandmother actually used dishes with a pattern very similar to these when I was a kid! LOVE! Rise & Shine is my favorite, but I love them all. 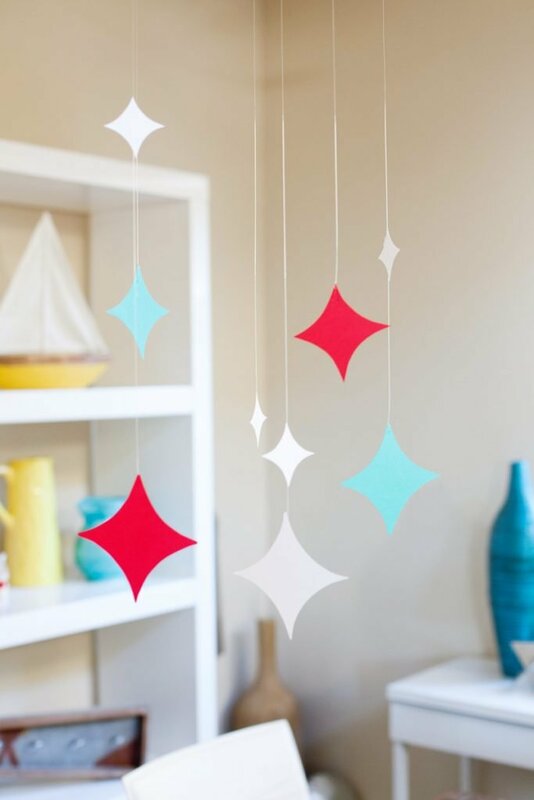 Oh I love this retro diamond design for decorating! For Vintage Charm, I like the Birds Of A Feather design! I love the Memory Lane 3-piece mixing bowl set! I like the Memory Lane design! There are so many amazing options! I love the Tickled Pink though. My favorite is the Vintage Charm™ Golden Days bowls. Thanks! The bold colors of the Spot On design are my favorite! So fun! Well, I love the Pyrex Vintage Charm Rise n Shine, but the Memory Lane is nice too. These definitely take me back to my growing up years. I still shop for vintage Pyrex as it brings back so many good memories. The Rise N Shine is my favorite! I collect the original Rise and Shine bowls. There so cute! I like the birds of a feather design. The Memory Lane design is fun, but the Rise N Shine is super fun and farmy. I’d love adding some farmy feel to my country farm kitchen. Golden Days just makes me smile! I love, love love the Memory Lane design! So classic yet inspiring! I like the Golden Days set. I love the rise and shine collection! I have one of the originals in my Pyrex collection! These would go perfectly in my vintage home. Loving the Rise and Shine pattern– These would make my mum so happy! I love the Rise N Shine design. The Rise and Shine is my favorite. Hi there! I adoore you and your parties! 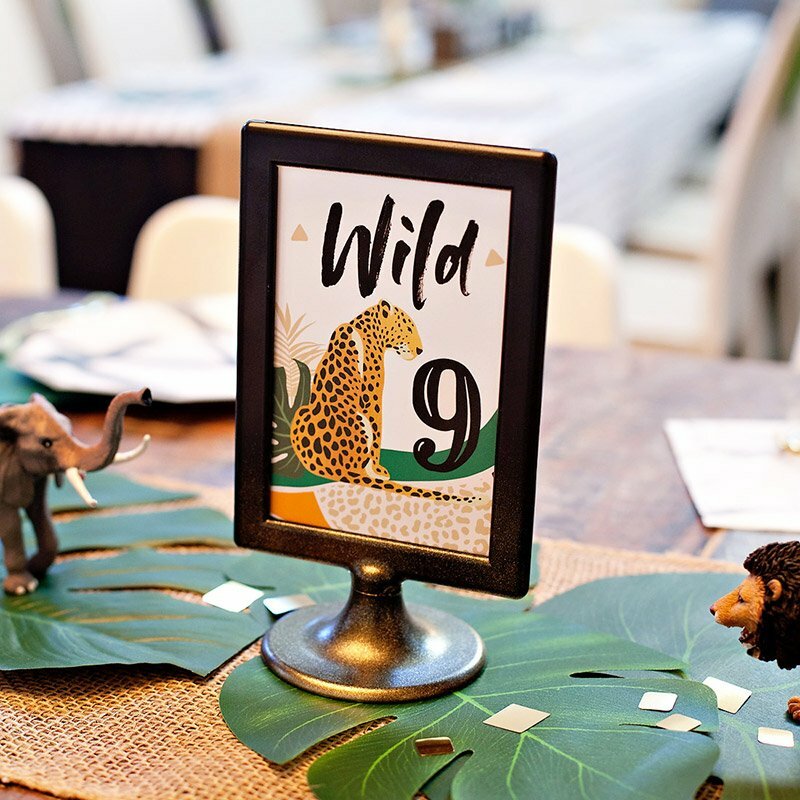 Would it be possible to know which fonts you used for the Place Setting Accents? Absolutely mix n match the rise n shine and spot on. Would perfectly match my kitchen. Love it! 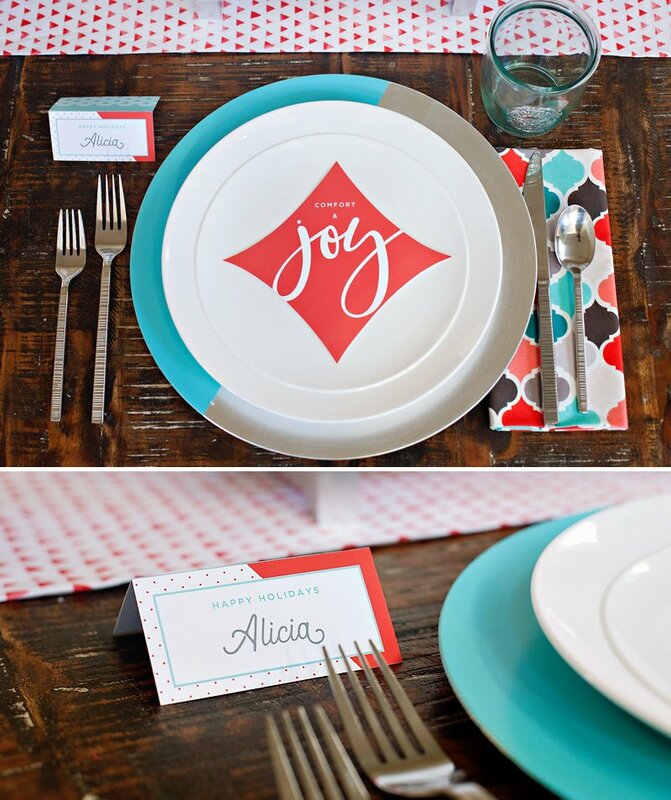 I like the rise and shine, I love the pop of color and pattern ! The rise and shine collection inspires me the most. It reminds me of baking with my grandmother when I was little. Being able to use the bowls inspire me to revisit all those homemade family recipes long since forgotten this holiday season! 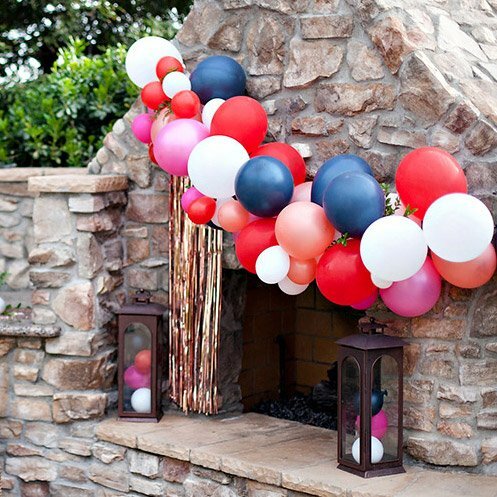 This is color scheme is one of my favorite :) plus I’m hosting Christmas dinner, I would LOVE to serve everyone in these! The Rise N Shine is absolutely adorable and definitely takes me back to Christmas dinners at my grandmas’. I actually just redid my kitchen with these colors, using a similar retro vibe. New dishware would be a great finishing touch! Such a fun party, by the way. 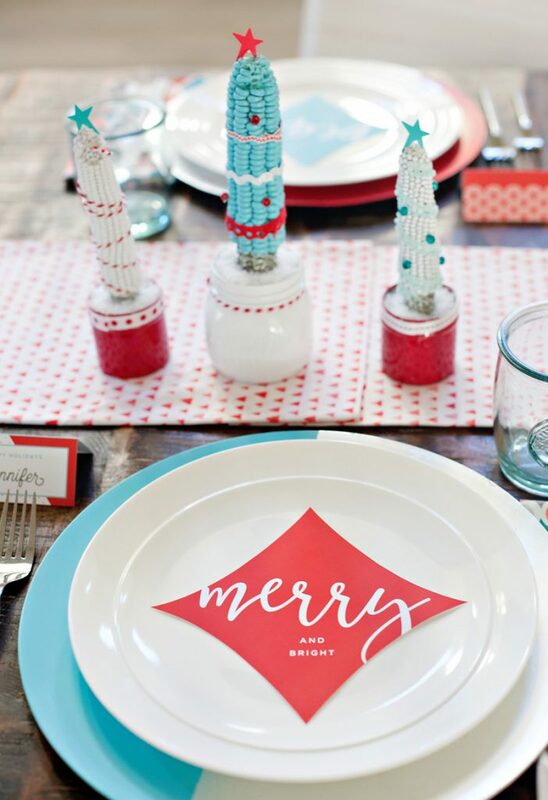 I love how you kept a holiday vibe, but incorporated a more modern color scheme. Fabulous! The farm design pattern is my favorite. I wish I could find a set. Thank you for a chance to win. Rise and Shine is lovely as turquoise is one of my favourite colours. 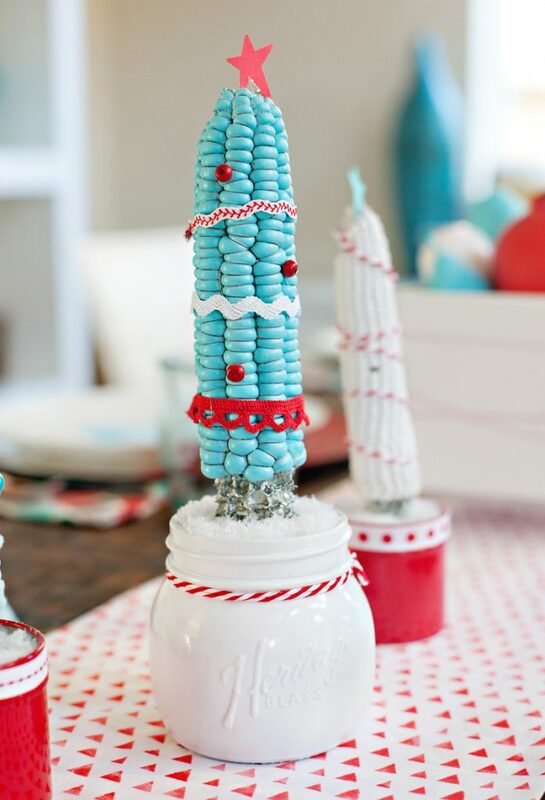 Love the red you incorporated and the maize “trees” are the best! I like them all but the birds of a feather pattern is my favorite! 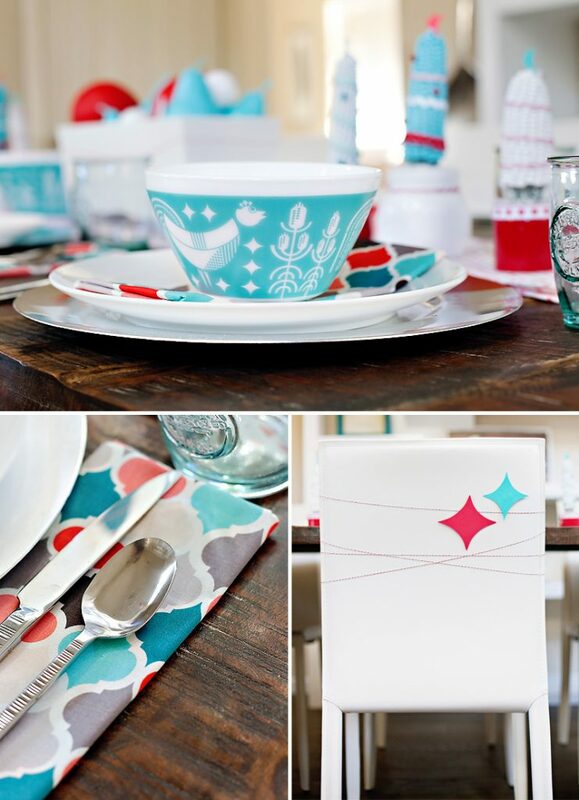 Love the Rise and shine collection..This whole spread is to cute for words..
LOVE the Rise and Shine:) The colors match my kitchen perfectly!!!!! I love Rise and Shine! Welcome to Northern California. I live in Sacramento.